So, I’m not doing too terrible with running in April. It’s still not great – I’ll probably only hit about 30 miles for the month, but I haven’t had any foot issues, which is absolutely excellent. AND, I’ve bee riding the bike a bunch. I snuck in a trail run at Arcadia ahead of the rain this evening. I’ve always loved the trail run, and am starting to get spoiled now that I’ve realized I don’t have to go out of my way to get in some good stumps, rocks, and mud. My “usual” trail is just off of IH-95. You can, indeed, hear the freeway from the trail. If ever there’s been a case for the iPod during running, this is it. Start up the music, listen to the woman say “Beginning Workout”, and I may as well be miles into a wilderness area. Nike+, by the way, works like a champ on the trail. One of the drawbacks of trail running has always been that mileage is a guess at best, especially during the summer when the foliage plays havoc with GPS. I’ve ran through puddles, run through mud, run through snow – whatever. Even though I’m using a velcro pocket on non-Nike+ shoes, I haven’t had any problems with weather and the foot-mounted transmitter. 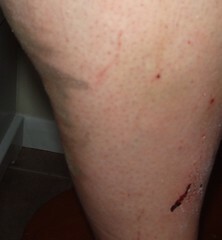 Anyway, the grody picture above – on the way back, I was feeling my oats, and started trying to hurdle the fallen trees. It was exhilarating. I’d done a loop, cut across from the I-95 trail to the North-South trail to head back to the car. North-South is way more rocky than the I-95 trail, so I spent a decent amount of time hiking instead of running. But, when I could run, I RAN – flat out, flying. About a half-mile from the car, I headed up, up and – crap. Caught my left toe, smacked my left shin, and face-planted into the decaying leaves. Hopped up, shook it out, and headed back to the car with a smile on my face. Nothing quite like feeling alive.